Multicollector ICPMS is the most versatile technique to analyze isotope ratios in a wide variety of applications. Ionization of the element of interest occurs in an ionized argon plasma. Ions then get separated on energy and mass before entering the detection system. 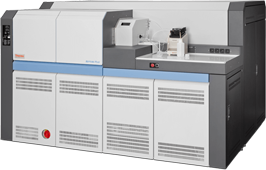 Our MC-ICPMS is a double focusing mass spectrometer, combining high resolution, high sensitivity and multicollection with latest innovations in amplifier technology, enabling high precise multi isotope ratio analysis down to trace levels. The mass spectrometer can easily be coupled to external sample preparation systems and peripherals, like Gas Chromatography, HPLC and Laser Ablation. We offer flexible and complete multicollector packages that can be configured to best suit the application, including dual detectors (Faraday/electron multiplier), multiple ion counters, RPQs. The new 1013 ohm amplifiers add to the flexibility and enable scientists to quantify small ion beams on Faraday Cups.